Nearly 3,000 more records related to the 1963 assassination of President John F. Kennedy were released to the public 26 October. Almost 4,000 records became available in July under a 1992 law requiring the disclosure of U.S. government documentation of the event. A few thousand remaining files remain under review. By coincidence, the releases come in the centenary of JFK’s birth. His death in Dallas was five months after his triumphal visit to Ireland. My search of the U.S. National Archives and Records Administration’s special Kennedy Assassination Records database found about two dozen documents with references to “Ireland” or “Irish.” The document images are not available online, but the result list provides some basic details. The collection includes a 22 November 1963 condolence cable from Taoiseach Seán Francis Lemass to President Lyndon Johnson, and resolutions of sympathy from Dáil Éireann. Johnson replied to Lemass on 29 November. Without reading the cable, it is impossible to say whether this “mayhem” foretold the assassination, or retaliation on the city for the murder of the world’s most famous Catholic Irish-American. In 1992, Oklahoma historian Kendrick Moore suggested the IRA may have killed Kennedy because he spoke out against isolationism from the Protestant north during his June 1963 visit. “It had to be the IRA; they are the last ones you would suspect,” he told The Oklahoman newspaper. 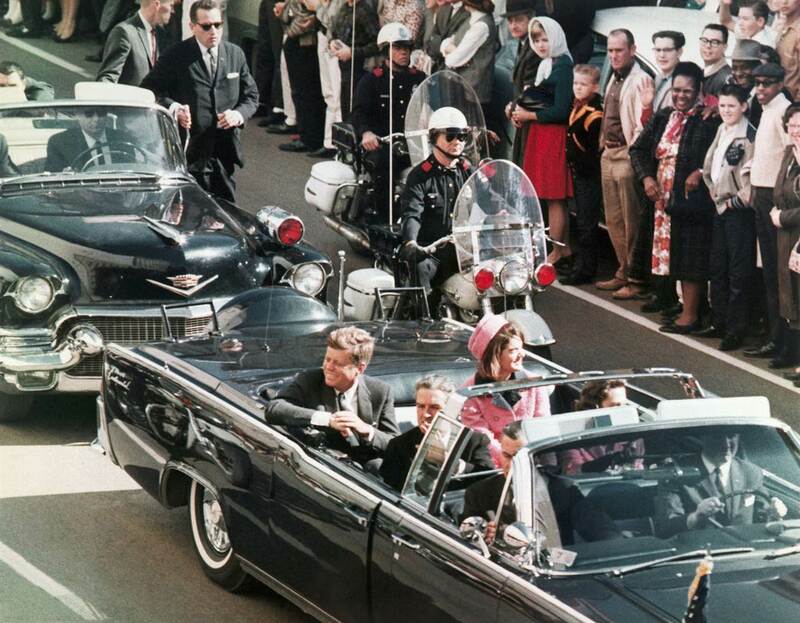 There are many conspiracy theories surrounding the Kennedy assassination. Here’s another: The index of the September 1964 Warren Commission report on the assassination is missing one letter, and only one letter: I for Ireland. JFK in Dallas shortly before the 22 November 1963 assassination. This entry was posted in History, Irish America, Northern Ireland, Politics and tagged IRA, John F. Kennedy, Seán Francis Lemass on October 27, 2017 by admin. 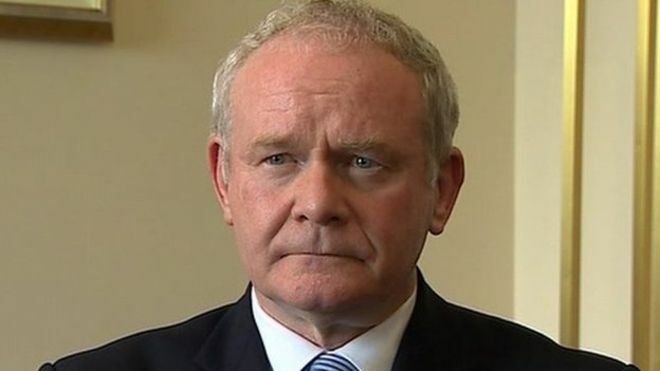 Martin McGuinness resigned as deputy first minister in January, forcing the Northern Ireland Assembly to shut down for a new election, held at the beginning of March. It was already clear the former IRA commander was ill, and he said as much in announcing his decision not to seek to re-election. Now, his death stirs further remembrances of The Troubles, and raises more questions about the future of the province as Irish nationalists and pro-British unionists face the uncertainties of Brexit. –Last tweet of Martin McGuinness, 1 March 2017, just before Sinn Féin‘s historic success in Northern Ireland Assembly elections. 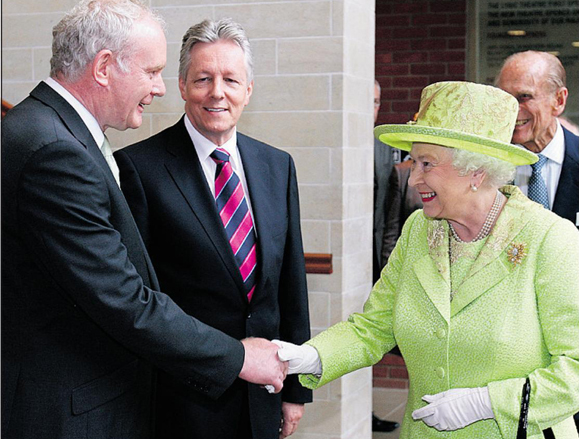 McGuinness and the Queen shake hands in Belfast, July 2012. Probably no other photo says as much about the arc of the former IRA leader’s life. This entry was posted in History, Northern Ireland, Politics and tagged Brexit, IRA, Martin McGuinness, The Troubles on March 21, 2017 by admin. Shaun Kelly, global chief operating officer for KPMG International, was born in 1959 and grew up in the Catholic Falls Road section of Belfast during the worst of the Troubles. One of his uncles was shot and killed by the British Army, which mistakenly believed he was holding a gun. Kelly said he didn’t meet a Protestant until he was 19. 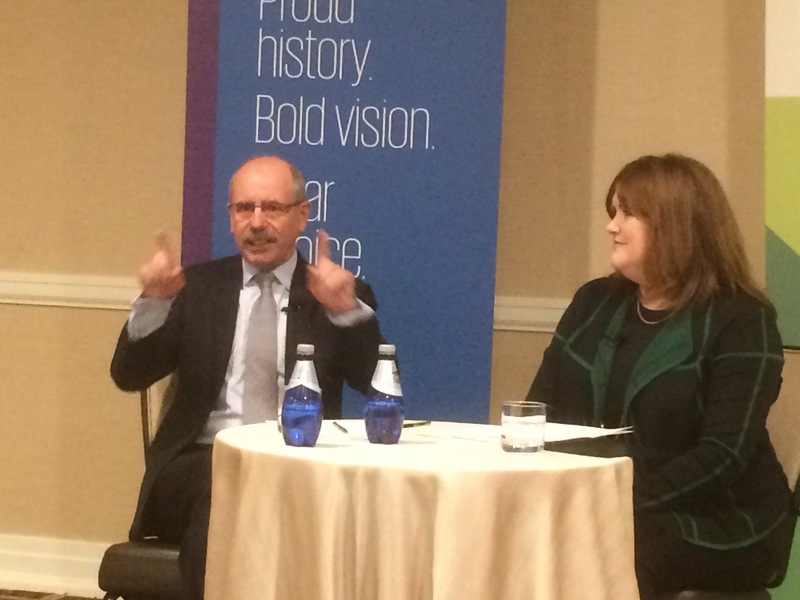 “You didn’t realize what you were going through,” he said during a 25 October Irish Network-DC event. “It’s really only when you look back” that the turmoil of the period can be put in perspective. Shaun Kelly, left, interviewed by Irish journalist Fionnuala Sweeney. Kelly attended University College Dublin with the help of a British government scholarship Ironically, it allowed him to continue playing Gaelic football, though he acknowledged being much smaller than the lads from Cork and Kerry. Kelly qualified as an accountant in Ireland and joined KPMG in 1980, soon relocating to the firm’s San Francisco office. 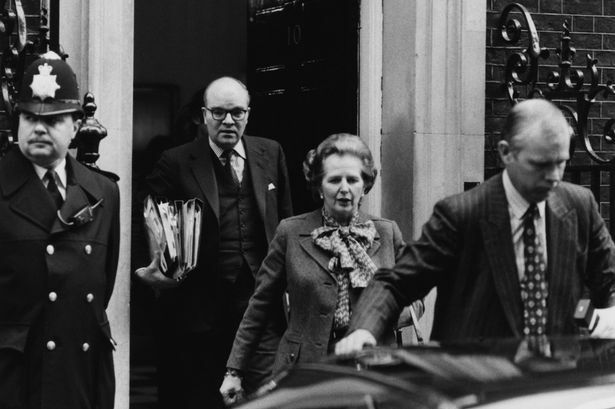 His tenure included a return to Belfast during an upsurge of violence in the 1990s. At the time, KPMG managed the Europa Hotel, known as the most bombed hotel in Europe. After one of those bombings, Kelly said he discussed the possibility of shuttering the operation with hotel staff. They would hear none of it. “The IRA didn’t close this hotel, some short accountant is not going to close it,” Kelly quoted one of the workers saying to him. His global travels and experiences with his native city have convinced him that economic development helps reduce violence by creating opportunities on both side of the sectarian divide. He acknowledged that Brexit will challenges both sides of the border between Northern Ireland and the Republic of Ireland. Here’s a more lengthy profile of Kelly from the October/November 2015 issue of Irish America. This entry was posted in Business & Environment, Northern Ireland and tagged Belfast, Brexit, Hotel Europa, IRA, Shaun Kelly on October 30, 2016 by admin. The latest iteration of the “Mafia” video game series, which references IRA violence, is drawing criticism in Northern Ireland for trivializing the Troubles. “Mafia III” is set in 1968 in a recreation of New Orleans. The player is on a quest to build a new crime organization to confront the Italian mob over the killings of his friends. Players game through the third-person perspective of fictional orphan and Vietnam War vet Lincoln Clay. Screen grab from “Mafia III” by 2K Games. 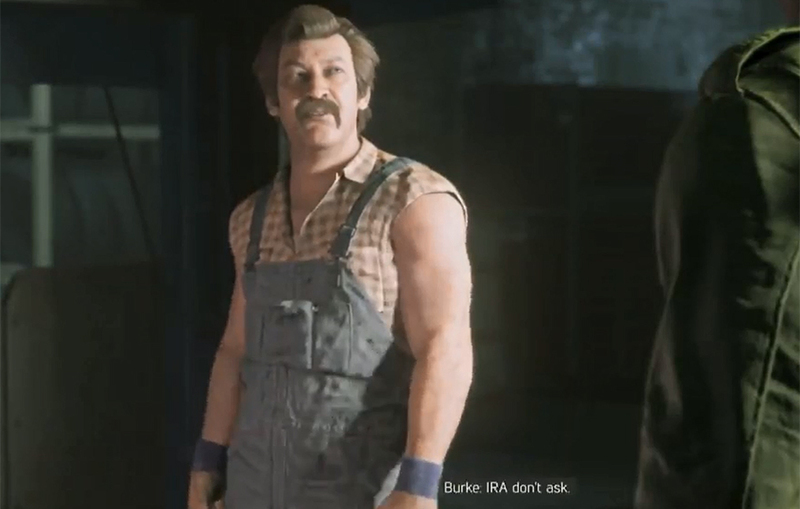 The game uses stereotypes to glorify the IRA, including drunkenness, rowdiness and extreme violence. 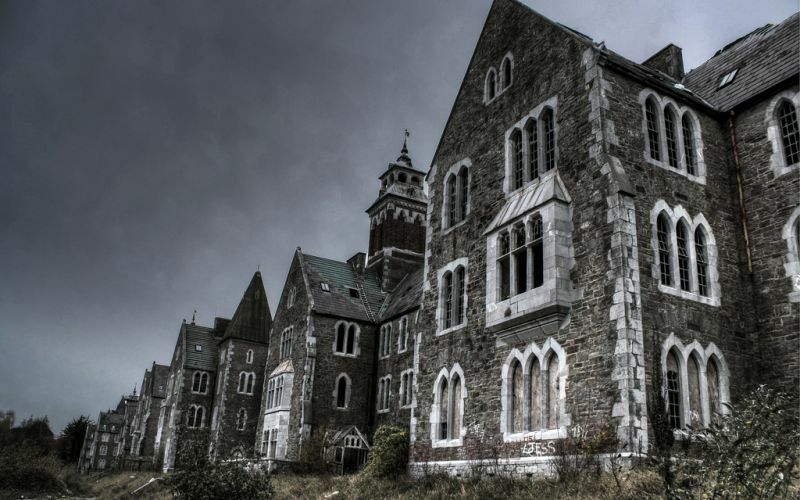 Using a time period as fresh and raw as 1960’s Northern Ireland, in my opinion, is a disservice to gamers–most of whom will have no idea of the actual events–and the public at large. As of 15 October, news coverage from the North has not included any reaction to the game from Sinn Féin or other nationalists. So far, “Mafia III” has been poorly received by the gaming community, so perhaps the damage of misunderstanding and myth perpetuation will be tamped down by poor sales. But it is sad to have the past dredged up in such a poor fashion that only perpetuates stereotypes and does not further discussion. This entry was posted in Arts & Culture, History, Northern Ireland and tagged IRA, The Troubles on October 15, 2016 by admin. A special three-member panel reviewing paramilitary organizations in Northern Ireland released its report 20 October 2015. The report found the Provisional Irish Republican Army (PIRA) “remains in existence in a much reduced form” and that an IRA army council is still operating, The Irish Times reports. More coverage from The New York Times. Northern Ireland Secretary Theresa Villiers commissioned the independent assessment of paramilitary organisations and organized crime in the six-county province in September to avert the collapse of the power-sharing government at Stormont. This entry was posted in Northern Ireland, Politics and tagged IRA, Theresa Villiers on October 20, 2015 by admin. The power-sharing government in Northern Ireland is going though yet another crisis. Whether this round, largely driven by police and government statements about the IRA remaining an active organization, is enough to unravel Stormont remains to be seen. This entry was posted in Northern Ireland, Politics and tagged Good Friday Agreement, IRA on September 1, 2015 by admin. Part 1, 1914-1916, looks at the run up to the Rising. Part 2, 1919-1921, explores the War of Independence. Part 3, 1922-1923, concludes with Ireland’s Civil War. 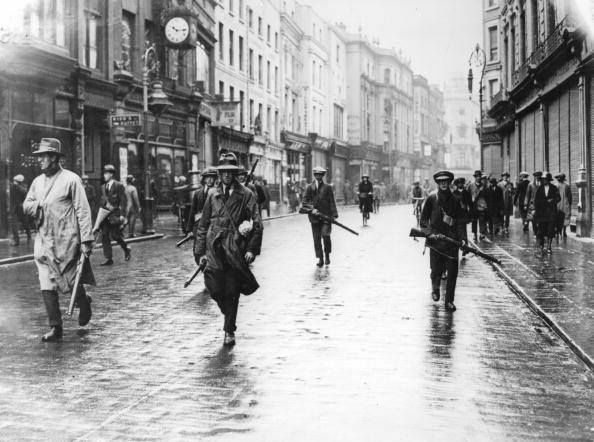 Anti-treaty IRA on Grafton Street in Dublin, 1922. This entry was posted in History, Politics and tagged 1916 Rising, IRA on May 22, 2015 by admin. 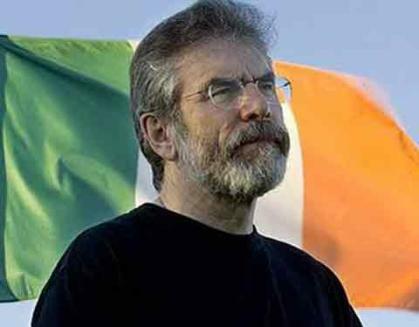 The CBS News program 60 Minutes has landed a rare interview with Gerry Adams. It airs Easter Sunday, 5 April. Snippets of the interview are being released early to drive interest in the broadcast and have already generated news headlines, such as this story in the Irish Independent. Here’s the 60 Minutes website and video clip. This entry was posted in Northern Ireland, Politics and tagged Gerry Adams, IRA on April 3, 2015 by admin.